If you're a former scout, you've probably heard the rhyme “leaves of three, let it be.” This mnemonic device, used to steer intrepid outdoorspeople away from poisonous ivy and oak, is generally sound advice for ensuring you don’t come home with a nasty rash. Not all three-leaved plants are the enemy, though, and several harmless plants are often confused with poison ivy. Microbiologist John Jelesko shared some tips with NPR for identifying this pernicious plant. First, it helps to know what you’re up against. Poison ivy is a master of disguise and can take many different shapes and sizes. It can appear in small patches, take the form of creeping vines or a bush, and can even mimic the appearance of a tree it has wrapped itself around. The leaves can have either “smooth, jagged, or lobed edges” and may or may not bear white or greenish berries. If the plant has thorns, you can be sure it’s not poison ivy, whose mode of attack is a little more stealthy. In the city, Jelesko had found that climbing vines are the more common form; look out for ground-creeping vines in forested areas. While there are exceptions to this rule, Jelesko’s research found that poison ivy tends to take different forms depending on the landscape. A longer middle stem and a hairy vine are also signs that you could be dealing with poison ivy. If you have a plant in your garden that you can’t identify, you can conduct a “black dot test” to see if it’s poison ivy. Put on a pair of gloves, tear a leaf in half, and place the sap on a sheet of white paper. 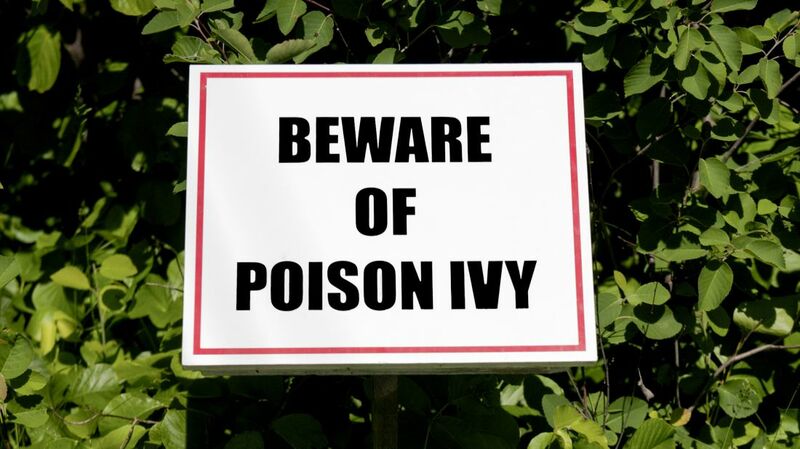 If it’s urushiol oil (the rash-causing chemical in poison ivy), it will turn black within 30 minutes. Sometimes, even our best efforts to identify poison ivy may fail. If you think you may have brushed up against it, don’t panic—take a shower within a few hours of contact. That should keep your chance of developing a rash at a minimum.